⋅ Approximately 35% of students are from out of state; students represent 38 states and 15 countries. ⋅ Approximately 60% of students are female and 40% are male. University of Lynchburg was founded in 1903 as a selective, independent, coeducational, residential college, with historical and current relationship to the Christian Church (Disciples of Christ), a denomination which values and celebrates all faith traditions. Previously known as Lynchburg College, the name was changed to University of Lynchburg on July 1, 2018. 250-acre campus located in the foothills of the Blue Ridge Mountains in Lynchburg, Virginia; 3 hours southwest of Washington, D.C., and 2 hours west of Richmond, Virginia. University of Lynchburg joins a group of only 215 colleges/universities in the United States that offers a Doctor of Physical Therapy program. Each class of 50 students will study and research in a new 37,000 square foot facility that rivals any other facility in the US, and includes a high-tech anatomy lab for cadaver dissections, two instructional labs for hands-on practice and research labs for motion analysis and other experiments. Our First Year Experience program, the Connections Program, recognized by the National Academic Advising Association continues to successfully guide new students through the college transition process. This program provides each freshman with an upperclass student mentor and groups meet weekly through the first semester of enrollment. University of Lynchburg is one of only 60 schools nationally recognized by the Corella and Bertram F. Bonner Foundation. The mission of the Bonner Leaders program is “to transform the lives of students and members, the life of their campuses, their local communities, and the world through service and leadership” by engaging students in ongoing, meaningful service work in non-profit settings. The Bonner Leaders program is just one of many opportunities which engage students in service and civic responsibility. In addition to the service work through the Bonner program, Lynchburg students contribute more than 70,000 hours annually to a variety of service initiatives. The stunning $12-million Doug & Elaine Hadden Drysdale Student Center opened fall of 2014. This 72,000 square foot expansion connects to the Burton Dining Hall and was designed to provide students with a special place for student activities and organizations, leadership development, a health and wellness center, and hub for community service opportunties. Schewel Hall is a 68,000 square foot state-of-the-art academic building, which is visually spectacular! While home to the College of Business and the Lynchburg College of Arts and Sciences, all students take classes here. 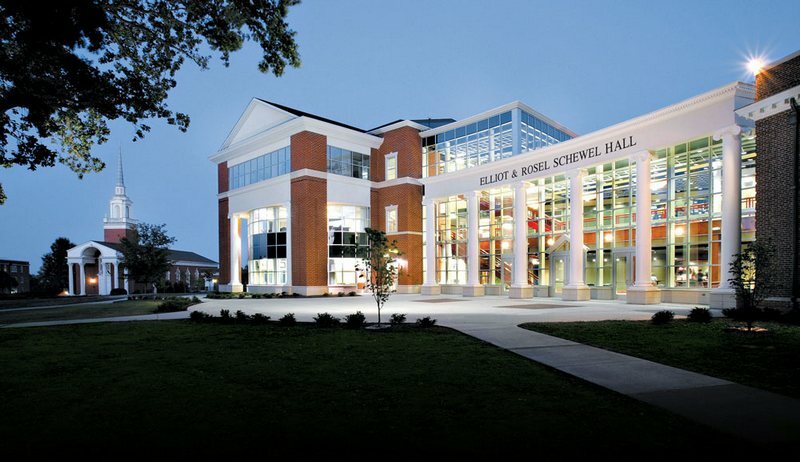 Features of Schewel Hall include the following: a Bloomberg real time trading room; specialized teaching-learning and focus group settings for business students; and the Donovan Media Development Center, which includes television and recording studios, desktop publishing and video projection equipment, and broadcast and print journalism facilities. The 250-seat Sydnor Performance Hall is used by students in music and also serves as a stunning site for a variety of special events. Claytor Nature Study Center, a 470-acre outdoor science laboratory with a new state-of-the-art research facility, is located 30 minutes from campus for environmental research as well as community partnerships in education. The University has expanded the Claytor Nature Study Center to include a dome observatory that houses the 20-inch Ritchey-Chretien telescope, an optical design also used in the Hubble Space Telescope. Students and faculty are now pursuing astronomical research in conjunction with other regional colleges and universities. In recent years, the number of applications has doubled and the entering classes have averaged 550 students each fall. All admitted students receive financial aid and scholarships. Merit scholarships range from $13,000-$22,000, renewable annually. 82% of full-time faculty hold the most advanced degree in their field; there are no teaching assistants. For the most current listings, please check the Lynchburg website. Housing is guaranteed all four years for undergraduates. First-year students live in two designated residence halls with programming and events designed toward each student’s success. Lynchburg has earned over 185 ODAC titles and has had over 247 NCAA All-American Athletes. Lynchburg alumni have success in a wide range of careers and in pursuing graduate studies. For information about recent graduates, please read this and this. Lynchburg College students prep for EU simulation event in D.C.